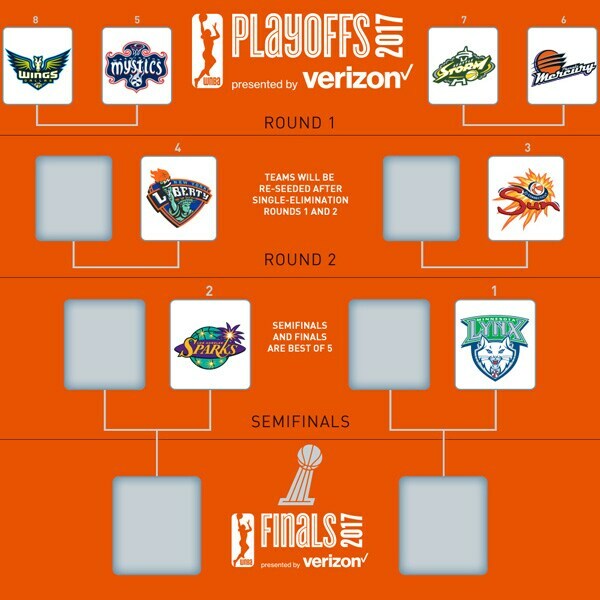 With a little over a week left in the 2017 regular season, the WNBA Playoffs are quickly approaching. So far, five playoff spots have been claimed. With a total of eight playoff spots reserved for postseason play, that leaves three seeds left to be taken. And although there is just a week or so remaining of the regular season, there is still a lot to be figured out before the playoffs begin on Sept. 6. In this week’s Race to the Postseason, we take a look at how the playoff race is shaping up. The Lynx have been the WNBA’s best team during the entire regular season. Minnesota, which got out to a crazy 20-2 start to the season, clinched a playoff spot on July 30 with a win over the Seattle Storm. The Lynx can clinch homecourt advantage in the semifinals round of the playoffs on Friday if they beat the San Antonio. In addition, Minnesota can secure the No. 1 overall seed in the playoffs by winning its next two games (Friday at San Antonio and Sunday at Los Angeles), or the Lynx can secure the top seed by winning four of their final five games. Of their five remaining games, two of Minnesota’s five opponents hold a .500 record or higher. Home: Chicago (Sept. 1), Washington (Sept. 3). Road: San Antonio (Aug. 25), Los Angeles (Aug. 27), Indiana (Aug. 30). Behind Minnesota, Los Angeles has arguably been the second-best WNBA team this season. The Sparks clinched a playoff berth on Aug. 10, their 17th playoff appearance in 21 seasons. Los Angeles trails Minnesota by 1.5 games for the best record in the league and top spot in the playoffs. Of their four remaining opponents, three of which are above-.500 teams, the game against the Lynx on Aug. 27 will definitely be one to watch out for. Home: Minnesota (Aug. 27), Atlanta (Sept. 1), Connecticut (Sept. 3). Talk about a bounce back season. After missing out on the playoffs with a record of 14-20 a season ago, the Connecticut Sun are looking to likely be the third seed in next month’s playoffs. The Sun trail the Sparks by two games for the No. 2 seed, while trailing the Lynx by 3.5 games for the top overall seed in the league. In its last 10 games, Connecticut holds a record of 8-2. The Sun have four games remaining and will face three above-.500 teams during that span. Road: Washington (Aug. 29), Phoenix (Sept. 1), Los Angeles (Sept. 3). New York is currently one of the hottest teams in the WNBA, trying to make a late push to get into the top three in the WNBA standings. The Liberty have won six straight games through Aug. 24 and are two games back of Connecticut for the No. 3 seed. They are 5.5 games behind Minnesota for the top seed. New York has four games left on its schedule. In three of those games, the Liberty will be facing teams below .500. Home: Washington (Aug. 25), Chicago (Aug. 27), Chicago (Sept. 1). Washington has floated around the middle of the pack for a majority of the season, even without the injured Elena Delle Donne. With five games remaining, the Mystics could really fluctuate around three seeds before the playoffs begin. They are a half-game behind New York for the No. 4 seed and are 2.5 games ahead of Phoenix for the sixth seed. In those five remaining game, three of them will be at home and three will come against above-.500 teams. Washington might just be hitting its stride right before Delle Donne returns. Home: Dallas (Aug. 26), Connecticut (Aug. 29), Seattle (Sept. 1). Road: New York (Aug. 25), Minnesota (Sept. 3). Phoenix could join the five teams who have already clinched a playoff spot as soon as Thursday night. The Mercury host Los Angeles on Thursday night in Phoenix. With a win, they clinch a playoff berth. A Phoenix win could also help the Lynx, as it would give Minnesota a two-game lead over the Sparks for the No. 1 seed. The Mercury currently trail Washington at No. 5 by 2.5 games and lead Seattle and Dallas by 2.5 games for the seventh and eighth seeds. In three of their last four games, Phoenix will play in front of their home crowd, but two of those games will come against the Sparks and Sun. Home: Los Angeles (Aug. 24), Connecticut (Sept. 1), Atlanta (Sept. 3). Seattle and Dallas are tied for the seventh spot in the playoffs, but the Storm hold the tiebreaker with a 2-1 season series lead over the Wings. Seattle seems to be picking up some speed after going through a coaching change earlier in the month. The Storm are currently 5-5 in their last 10 games. Of their last three games in the regular season, two will come against teams above them in the standings in Phoenix and Washington. Road: Washington (Sept. 1), Chicago (Sept. 3). With three games left on its schedule, Dallas is hoping to make a push to grab the eighth and final playoff spot. The Wings are tied with Seattle record-wise, but Seattle holds the tiebreaker. The two teams behind Dallas to look out for are Chicago and Atlanta. The Sky are currently two games back of Dallas, while the Dream are three games back. Of their three remaining games, probably the biggest game will be against Chicago on Aug. 30. with a win, Dallas will likely clinch that final playoff spot. Home: New York (Sept. 3). Road: Washington (Aug. 26), Chicago (Aug. 30). Of the two teams still in the hunt, Chicago might have the best chance to push its way into the top eight. The Sky have five games left on their schedule, tied for the most left of any WNBA teams. It won’t be an easy task for the Sky, however. All five games will come against teams currently in playoff spots and they will have to beat three top-four teams on the road. Home: Dallas (Aug. 30), Seattle (Sept. 3). Road: Connecticut (Aug. 25), New York (Aug. 27), Minnesota (Sept. 1). Atlanta technically is still in the hunt for a playoff spot, although it will need a lot to happen to get in. The highest the Dream would be able to get is the eighth seed in the playoffs. They currently trail Dallas and Seattle by three games, but Atlanta might be running out of time with just three games left on its schedule. Of their last three opponents, they will have to travel to face Los Angeles and Phoenix on the road. Road: Los Angeles (Sept. 1), Phoenix (Sept. 3).